White, blue and red. These are the colors of Santorini. 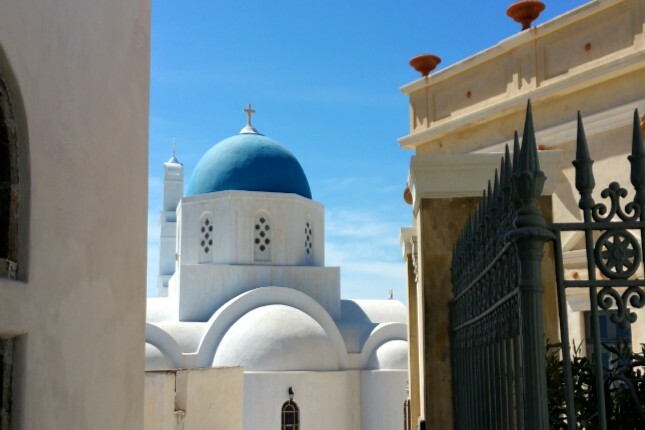 Join us on our 6-hour private Santorini-Akrotiri tour as we unfold the mystifying past of the island. Visit the excavations of a 3600-year-old preserved town, believed by many to be the lost paradise of Atlantis! 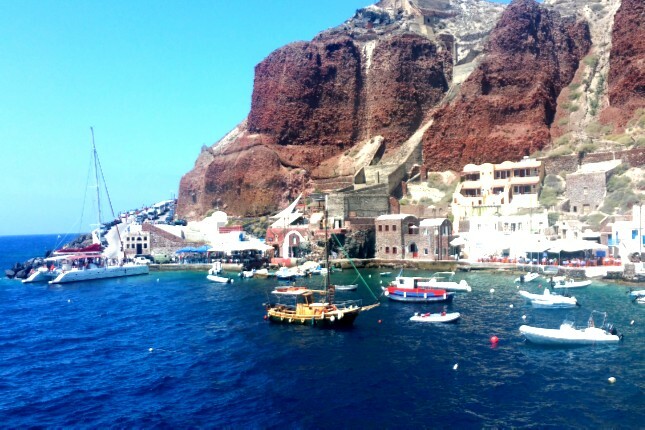 The tour starts from the Old Port, where you will take the cable car to the town of Fira. 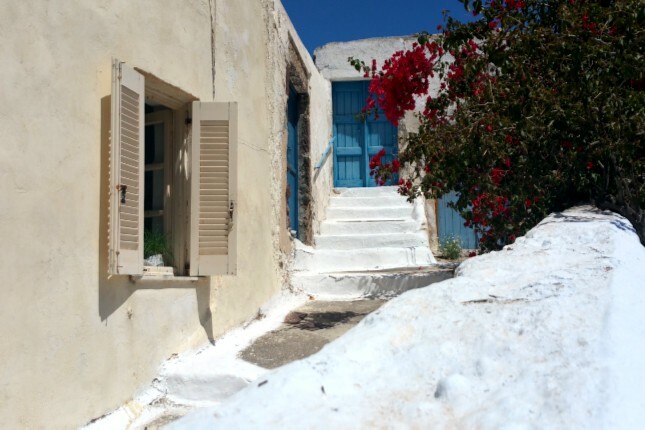 There, at Fira town, your local tour guide, along with your fully air-conditioned vehicle, will be waiting to welcome you and together you will explore the lesser-known side of Santorini. Your first stop will be at the archaeological site of Akrotiri, a listed UNESCO monument. A guided tour by a certified tourist guide will initiate you to the past of the island through the remnants of the everyday life and images of the ancient town. A settlement which was saved from the passage of time by the volcanic ash and often referred to as the “The Pompeii of the Aegean”. 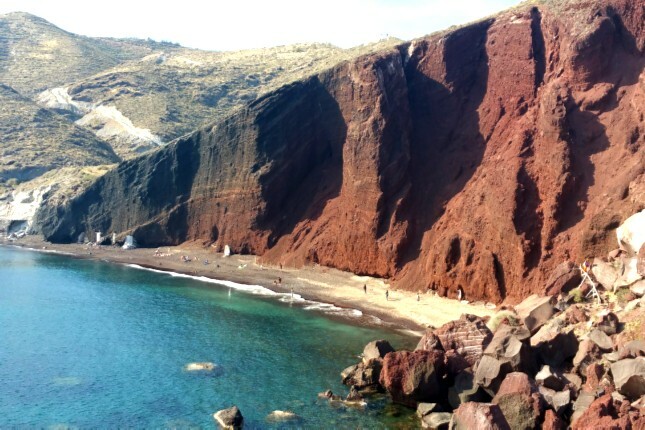 Then, less than a mile away from Ancient Akrotiri, you will have the opportunity to capture unique images of the Red Beach, one of the most photographed beaches of the island. 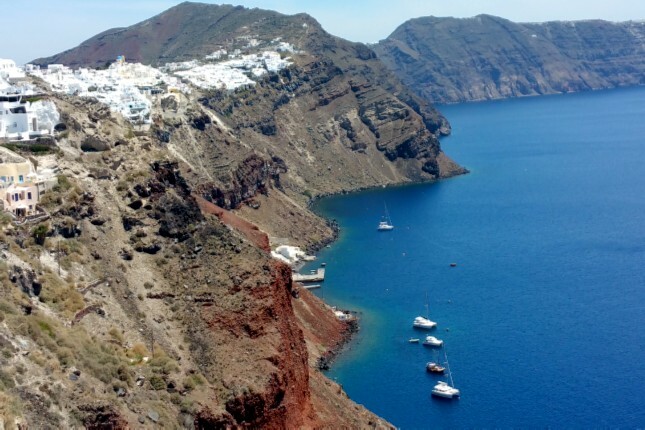 This natural marvel created by a volcanic eruption, the largest on the planet in the last 10 000 years, proves, yet again, the captivating geological past of Santorini. 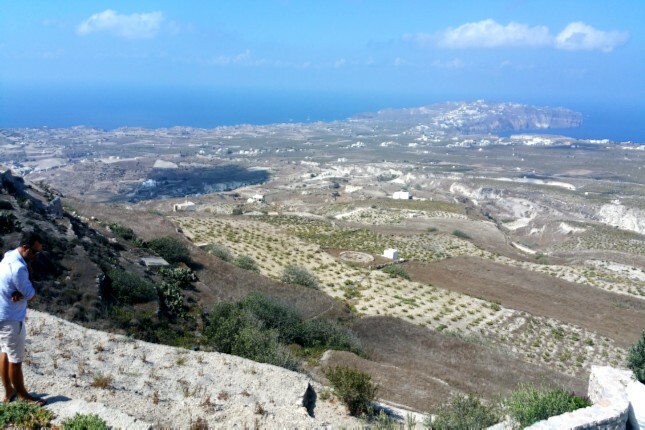 Board your mini bus and drive through the countryside of the island, as you enjoy the unique landscape and the numerus vineyards as well as the quaint villages with their famed white-washed island houses. Another opportunity for breathtaking views will be offered at the Monastery of Profitis Ilias, where you may enjoy the island from its highest point. Finally, at  Oia, the capital of the island and one of the most famous and most photogenic destinations in the world, you will enjoy a guided walking tour with your tour guide. Then enjoy some free time shopping in the various boutiques, tasting the local delicacies or even discovering its hidden paths! 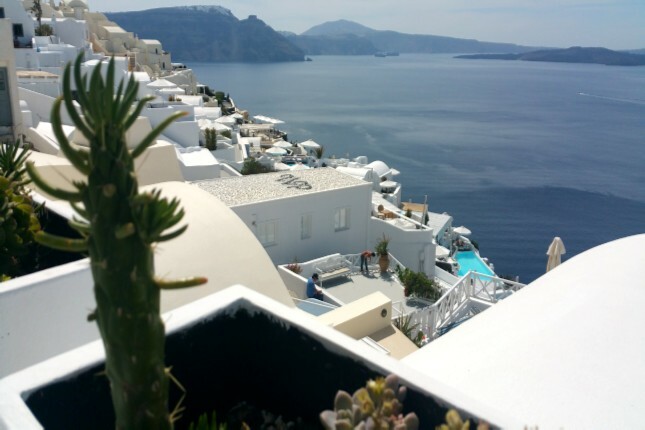 On your return to Fira where your tour will be completed, you can either spend time exploring Fira village at your leisure OR take the cable car to return to your ship. Fira Town: Fira is the ultimate setting for a stroll through the alleys bustling with souvenir shops and charming cafes. Enjoy a coffee or even a cocktail at the caldera as you unwind to views of the charming cave-houses nestled into the rock of this great cliff. 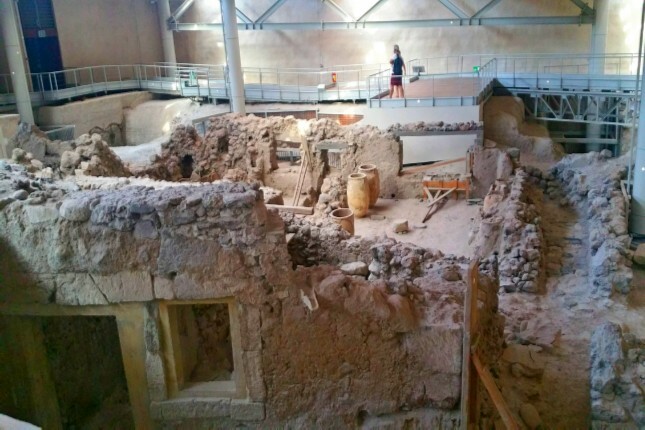 Akrotiri excavations: Walk through the ancient streets while you listen to the thrilling story of the great volcanic eruption that took place here 3600 years ago. Is this really Plato’s legendary lost city of Atlantis that has fascinated both academics and romantics for thousands of years? 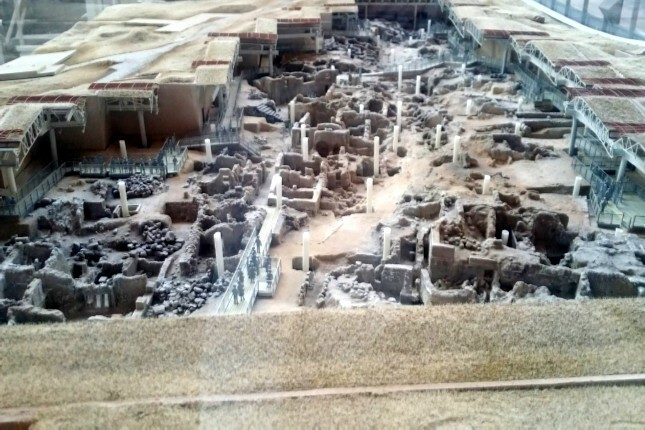 Under a thick layer of volcanic ash, archaeologist have found multi-storied buildings, wall paintings, furniture, vessels and a draining system. These findings indicate the existence of a highly sophisticated and prosperous society; Greek history in all its grandeur! Red Beach: From here, absorb the magnificent view of the volcano. This scenic cove is enclosed by steep red cliffs that create a wild, mesmerising scenery. 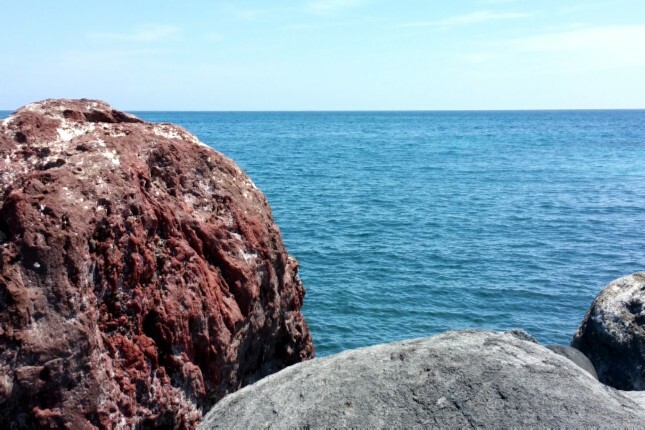 Stand at the top and take in the view of the enormous volcanic rocks situated in the sea, small pebbles and sand of various color, mainly red, all along the beach and the appealing dark blue waters. This wonderful palette of contrasting colors will mesmerize you. 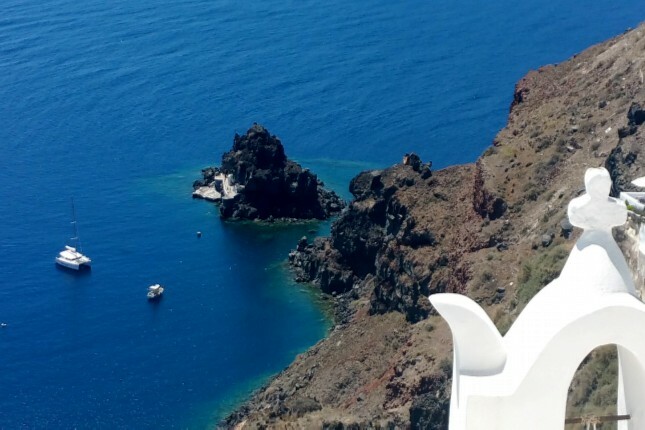 Monastery of Profitis Ilias: Situated on the highest point of Santorini, this breathtaking setting offers panoramic views of Santorini from above. 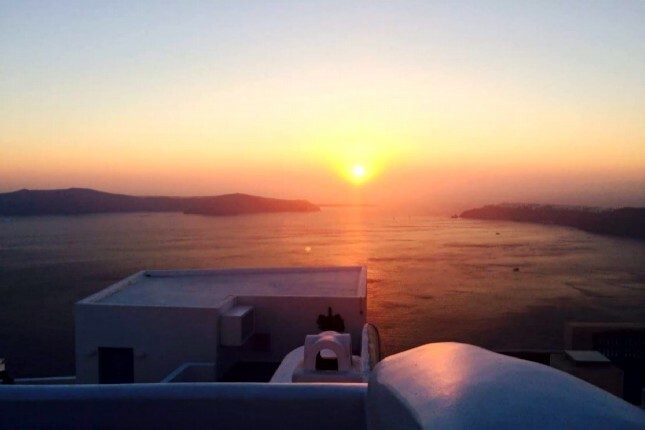 Oia: One of the most famous and most photographed villages in the world. 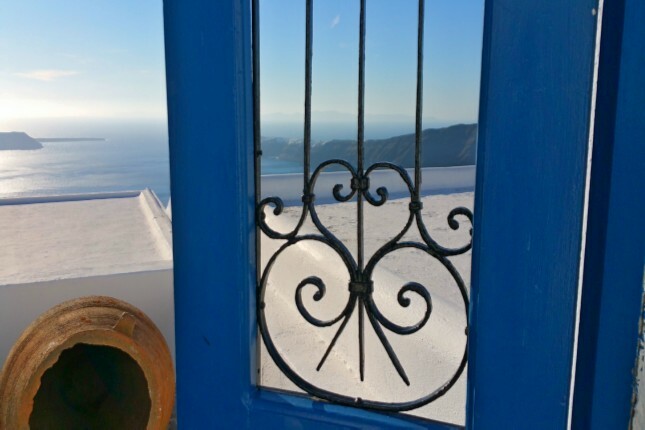 Oia stands out beautifully with impressive traditional houses, art galleries and domed white and blue churches.